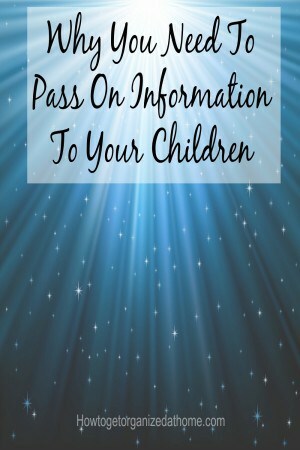 I have thought about the information that we all need to pass on to our children and relatives especially in case of an emergency, but the thought that was going through my mind is when and where do you share this information? What if something happens and people need information, how do they get the information, but not all the details before they need them? I know that you should have a will, but how do others’ know where this is? The idea of having your own personal information is just that, personal, and honestly, you don’t necessarily want everyone to know your business. However, there are times that you do need to share information with others and it is doing this, which is causing me to question how. The only idea that I can think of is to have a personal information leaflet that family know where it is. From that they can gain the information they need to the source of the actual documentation. This document would need updating on a yearly basis, or when information changes, but I thought this was a better method than many other ideas that I have had. It is also useful for your own purposes; you can keep track of your important financial paperwork, like whom your car insurance is with or who holds your current will. I am not saying not to store the paperwork in your filing cabinet, but if you have a detailed list of information, it is quicker for others to know where to look for the information. I was thinking about this different aspect of life and how not all the information we pass on is in fact private, but for many people they might not feel a need to connect, until often it is too late. How many times have you heard someone tell you the same story over and over again, but in truth how many times have you actually listened to the details? This is something that I have thought about, whilst I am not someone interested in the history of my family as such. What I do want is to have those details, so I can pass them on; someone might find those details interesting in the future and without recording them, how will they know the names and the dates of those people in my own history? The idea of a family history book, one where you can go back over the details and the names of family members past, is something that would be nice to pass on, so my family can fill in the details of their family. However, in the modern world, this does seem a dated and a very difficult process, especially since travel is so common, connections can and will be lost and the potential for this family history book, too, could vanish. So, how to pass on this information, how to connect the roots of my family, in case in the future someone wants to know? The solution, I am yet to find, I don’t know what would work best and who are responsible for it? Therefore, I want you to think about the information that you want to pass on to your children, what you want them to know and when. How do you intend to ensure they have information when they need it. Let me know what you decide, it is a very interesting question and not one people want to talk about until it is too late. If you are looking for more articles on this topic head over to the landing page where you will find links to other posts on organizing personal information.